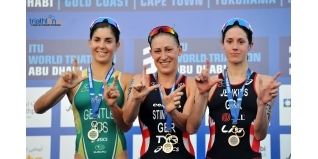 The 2016 World Triathlon season kicked off on Saturday with the Olympic distance ITU World Triathlon Abu Dhabi. It would prove to be a superb day for British athletes, with Jodie Stimpson and Helen Jenkins finishing first and third respectively in the women's event. Superb performances from two athletes who are under intense pressure with just one spot remaining for the British Olympic Games team for Rio. Their final, as we understand it, showdown for Olympic selection will take place on the Gold Coast in five weeks time. I said in the weekend preview of the men's race that, "statistical logic suggests that this is a race for either Mario Mola (ESP) or Richard Murray (RSA). Given they were first and third last year (with Luis second), that adds further credibility to that thought." That proved to be spot on, as despite missing the first group in the swim and incurring a transtition area penalty - 15 seconds to be served during the run - Mola was a comfortable winner with Richard Murray taking the Silver. Check out the video highlights from the race here.